This section features trading systems and methods, the latter in the form of an e-mini day trading course. They are primarily designed for ES (the S&P 500 e-mini futures) and YM (the Dow Jones e-mini futures), although the trading course based on robust discretionary methods can work in other e-mini futures markets as well. All of them are e-mini day trading systems (or methods), meaning they do not hold their positions overnight. You need only a very basic charting software to implement them for your trading such as NinjaTrader or Sierra Chart. If you use either of them, you can also obtain indicator templates for trading the systems. Following in the footsteps of George Foreman, I decided to name all the mechanical e-mini trading systems offered for sale here George and some bonuses that may come with them Georgette. I also added Roman numerals next to them. That's for those who might somehow be overwhelmed by the simplicity of George Foreman's idea. The systems currently featured here are just a sample of a larger set of e-mini futures trading systems offered by me over the last several years. Some of these systems (George I and George III), being counter-trend in nature, worked well in relatively low volatility conditions of 2006-2007, others (George II and George IV) would do well when volatility was higher. This is due to the fact that George II is a breakout system and George IV is a momentum system. While some systems have disappeared from here because they proved unsuitable for the volatility conditions prevalent at the time, one system (George V) was made unavailable to the public because it was performing so well that some guys with deep pockets requested exclusive rights to it. I believe the systems available at present can be useful for those who want to position themselves better in the trading game. The ideas they are based on are sound and have been tested successfully over many months, years, in fact. New systems may be added in future. 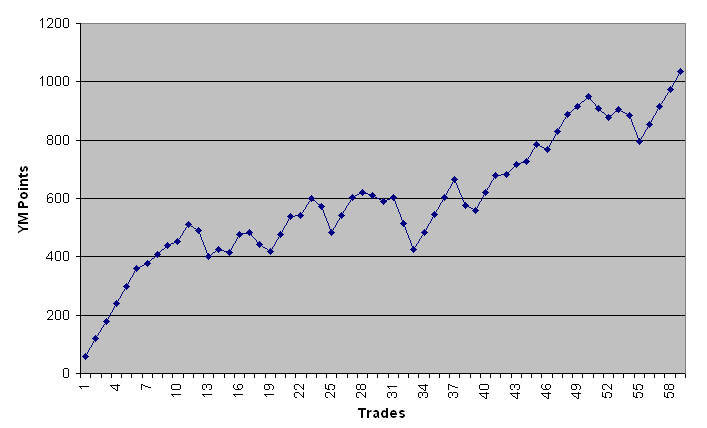 However, the main e-mini trading product offered at this point and one that is likely to remain such in the near future is a comprehensive e-mini day trading course named KING, which now also includes George IV (along with other systems of George Collection - see below) whose equity curve is presented above. Based on an original e-mini day trading methodology, by which I mean a set of trading strategies and ideas, not only is this by far one of the least expensive of such courses out there, but, being highly effective, it is quite a winner as well. In the hands of a trained trader, its results are short of stunning. The course was designed for the Dow e-mini futures market, it works well in the market closely correlated with it, the S&P 500 e-mini futures, and should be useful for day trading other markets as well, even Forex or stocks. However, try it for YM or ES first.